First NEW 2019 Chausson Titanium on the road at T C Motorhomes. Jo & Jude from Whitstable are pictured taking delivery of their very first motorhome, a brand new Chausson 640 TITANIUM, one of Chausson`s new model range for the 2019 season. From our showroom located in Herne Bay, Kent. Jo has deliberated for a few weeks now as to which might be the right layout for her and her family and ultimately had no hesitation in choosing Chausson`s new 640 Titanium. The Chausson 640 Titanium is a brand new model for 2019 on the fantastic Ford chassis, complete with 6 x Speed Automatic as standard equipment. Jo is hoping that the motorhome will be in regular use, including day trips to the seafront with her mum and family trips further afield, the first of which is next weekend to Thetford and beyond! Shane Catterick and all of the team at TC Motorhomes wish Jo & Jude all the best with their brand new adventure ! For more information about the Chausson TITANIUM, or any of the other motorhomes within the Chausson range call and ask for either Peter, Neil or Shane at T C Motorhomes: 01227 289111. 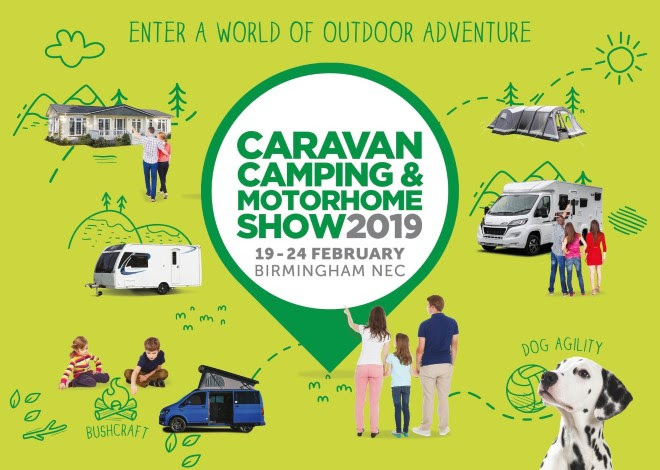 The 2019 Caravan, Camping and Motorhome show at the NEC in Birminham has some new entertainment coming. There will be a new 'Camping Zone' where visitors can experience the latest in camping trends. The Bear Grylls experience is for anybody who loves a bit of a challenge. There will be speakers, celebs, even some cooking demonstrations, this isn't just about Motorhomes! Anyone who has been before will of seen the top dog arena show which is back again next year, so you have enough time to teach your dog new tricks over the winter months. But best of all, you can come and view the 2019 range of motorhome's on offer and speak to one of our experts who will be happy to answer all of your queries. If you want to find out about how to get tickets visit: https://www.ccmshow.co.uk for more information. Jonathan & Julian from Tenterden are pictured taking delivery of the very first Chausson TITANIUM 767 Ga Motorhome. The Titanium 767 GA has a terrific standard specification and is a brand new addition to the Chausson 2019 range of Motorhomes. This model includes the Ford Transit base, 2.0 Euro 6B 170 BHP engine, with a 6 x Speed automatic transmission. Also included is the electric De-Frost Windscreen feature, Smart Lounge and much more besides. The TITANIUM also has a distinctive appearance with attractive silver grey side walls and inside there's the unique Gladstone trim. Jonathan commented that the terrific garage on the Chausson would be very useful for longer trips, when additional luggage, bikes and barbecue all need to be stored. If you would like to find our more information about our Chausson Immediate Delivery stock we have here on site in Herne Bay Kent, please feel free to contact us to book an appointment. Appointments are not necessary if you would like to just visit and take a look at the motorhomes on display in our modern showroom. Find out how to contact us here: Contact TC Motorhomes. T C Motorhomes of Hillborough, Herne Bay have announced that they will become mainland UK`s only solus Chausson Motorhome Dealership with immediate effect. Tony Chamberlain and Shane Catterick are pictured being congratulated on their decision to become a `solus` Chausson Motorhome Dealership. Was an easy one for T C `s.
T C Motorhomes were appointed main dealers for Chausson Motorhomes in 2013, and since then the relationship between the two companies has flourished, and gone from strength to strength. 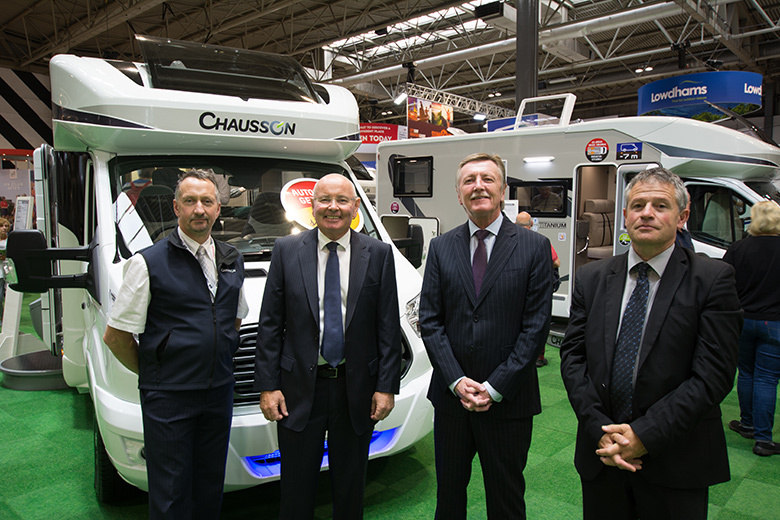 Chausson`s popularity continues to grow across Europe as consumers fully appreciate the innovation, the quality, the depth and wide range of products, and the modern contemporary styling that have become the watchwords at Chausson. Seek to continually improve the Chausson experience at it`s Dealership in Hillborough, just outside Herne Bay, East Kent. The future`s bright, the future`s CHAUSSON ..